This Gaudi walking tour explores the work of the magical architect who single-handedly made Barcelona so unique – Antoni Gaudi, in the early 1900’s. It is our introduction to Barcelona. After studying amazing stories hidden in Sagrada Familia facades we then move by metro towards “Passeig de Gracia,” where modern-day Barcelona first started, and we explore Eixample – the template district for the rest of our city – and we see Gaudi’s main constructions – Casa Batlló, Casa Milà etc. We also discuss the human stories behind each of these buildings – who commissioned each of these works and why, and what it’s like to live in these buildings. 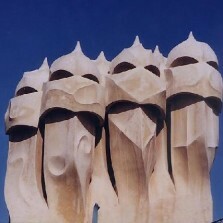 We discuss what Gaudi was trying to do – his “catalanity” philosophy. Our tour ends in front of Casa Batllo which you can visit right after our tour. 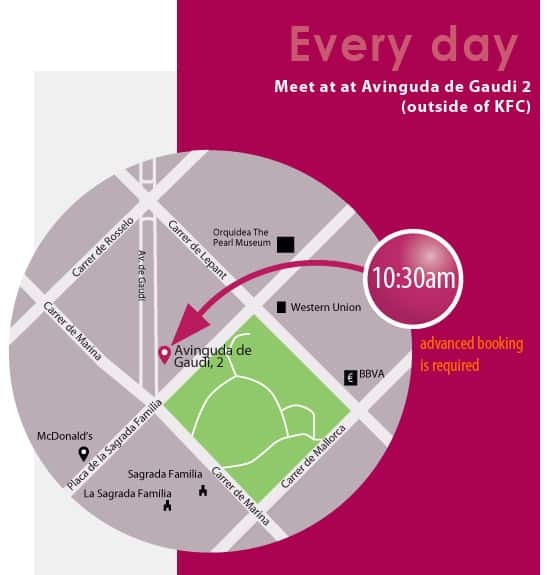 Our Gaudi tour start on time every day at 10.30am rain or shine and last a leisurely 90 minutes. We meet outside right nearby Sagrada Familia, in Avinguda de Gaudi 2 (in front of KFC). Your guide will be wearing a pink vest. €22 per person – booking needs to be made 48 hours in advance.